Since the 1940s, millions of land mines have been scattered around the world and an estimated 15,000 to 20,000 people, mostly children, are killed or maimed every year, according to the International Campaign to Ban Landmines. Global casualties spiked to a 10-year high in 2016, while clearance funding hit a 10-year low. For nearly four years, scientists in Franklin & Marshall College’s Earth & Environment, and more recently Physics & Astronomy, departments have worked with an international team, funded by NATO’s Science for Peace and Security Program, to develop a remotely operated land mine-detection system that would assist safe removal of these weapons. Now, a major milestone has been passed with the construction of a working robot prototype, and testing is about to begin on the sophisticated imaging sensors that are F&M’s responsibility. “We now have the device we intended to build,” said Tim Bechtel, director of F&M Science Outreach and associate teaching professor of geosciences. As Professor Bechtel and the Italian engineers look on, F&M Physics Professor Crawford examines the robot that NATO’s Science for Peace and Security Program commissioned. The small, lightweight, all-terrain vehicle has an impulse radar (a transmitter with an array of four receivers) for fast detection of buried objects, and a holographic imaging radar for discrimination of landmines from harmless junk and clutter – both cantilevered on arms protruding from the front of the robot. The operator never enters the mine field, but directs the robot with a remote control. “As the robot crawls through the field, it stops when it pings something with the impulse radar, and deploys the holographic radar that makes very accurate plan-view images of the detected target,” Bechtel said. Scanned images are sent in real time to the local operator in a safe location nearby, but could just as easily be sent to experts watching the robot on a computer screen almost anywhere in the world. Researchers at the University of Florence test the robot in the courtyard. F&M's Gaby Sallai, a junior physics major, will help with testing as a summer Hackman Scholar. Her work will involve testing the robot’s 3-D camera system. Among the students involved in this effort is Gaby Sallai, a junior physics major who will help with the testing this summer. As a summer Hackman Scholar, Sallai’s work will involve testing the robot’s 3-D camera system, which will provide highly detailed data on the terrain ahead of the robot. The data will be used to navigate to avoid obstacles, to make corrections to or “sharpen” the holographic radar images, and hopefully, with the assistance of a powerful line laser, to provide detection of trip wires that are often used to trigger mines or IEDs. Sallai plans to go to graduate school for engineering, and the Italian engineers on the project have invited her to the University of Florence for a couple of weeks this summer to work on her Hackman project there. “This is giving her a chance to get involved in an engineering project,” F&M’s Associate Professor of Astronomy Fronefield Crawford said. 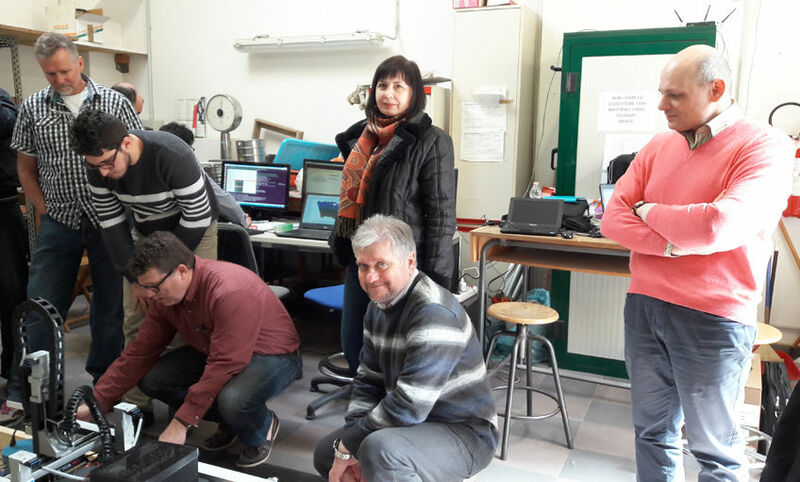 As an adviser on the project, Crawford’s role has been to question the detection system from a physics perspective and to make suggestions that could lead to a more effective robot. The robot’s purpose is to safely assist local governments and residents in areas where past wars have left behind minefields. The robot is designed to be inexpensive – built largely with commercial off-the-shelf components – and to be readily operated, maintained, or even built, by non-expert locals. The United Nations estimates it would take 1,100 years to remove the world's land mines using the current and often deadly system of probing with a spike. The robot is expected to speed-up detection of mines and reduce casualties. 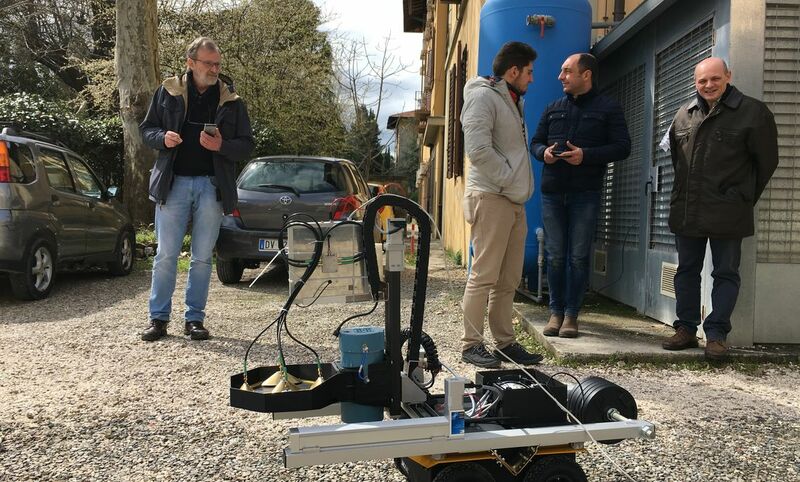 The robot demonstrated mine-detection this year at the University of Florence.